The second presidential debate was a whirlwind of accusations, fierce arguments, and, of course, memes. One of the biggest and best memes to come out of this presidential election so far was about Ken Bone, the Belleville, Indiana man who got the opportunity to ask Hillary Clinton and Donald Trump a question about energy policy. And with one simple question, he won America's hearts. Why is Ken Bone a meme? The real question is: How could he not be a meme? 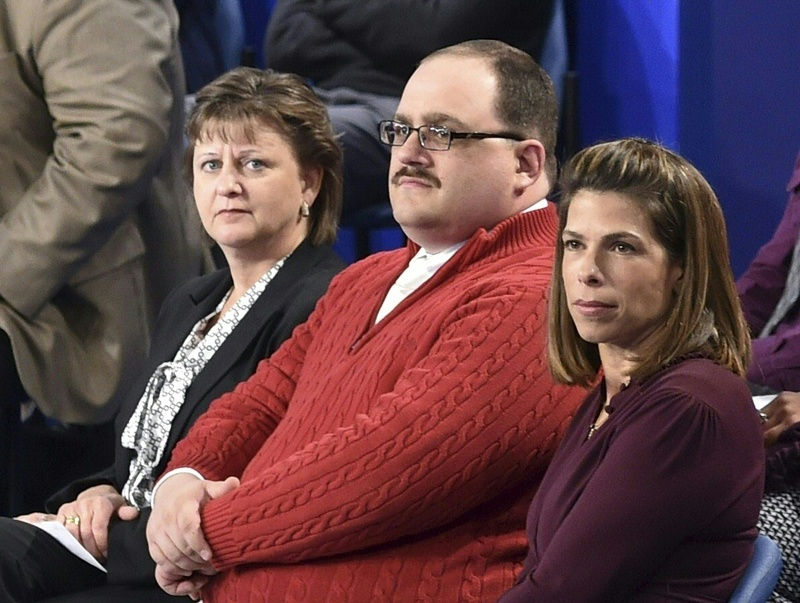 Bone entered the spotlight during the debate on Oct. 9, when he made an instant impression with his red sweater and clipped mustache. Combined with his slight, endearing lisp, as well as his resemblance to a certain Pixar character, people started posting online about Bone right away. Less than one hour after the debate ended, one Twitter user posted a screenshot from his phone, about to delete 119 images of Bone, with the caption: "When someone asks to borrow my phone: me - 'yeah just one second.'" The meme really exploded when Bone whipped out an old-school disposable camera to take pictures of the event. The Bone fandom has only grown since the initial online reactions, as his various media appearances in the interim have proven just how cute and lovable he really is. "Do you have any idea of how adorable you are?" Jimmy Kimmel asked when Bone phoned in to the show. With sassy confidence, Bone replied, "That's a definitive yes." Bone revealed in the interview that participants in the town hall debate weren't allowed to have phones or digital devices on them, explaining the presence of the disposable camera. Bone also told reporters that his now-infamous red sweater was a Plan B that he's happy made it into the historical night. "I had a really nice olive suit that I love a great deal and that my mother would have been very proud to see me wearing on television," Bone told CNN's Carol Costello in an interview. "But apparently I've gained about 30 pounds, and when I went to get in my car the morning of the debate, I split the seat of my pants all the way open. So the red sweater is plan B, and I'm glad it works out." No one can really say why Bone caught on as a meme — there's a definite randomness to these things — but he brought a certain dad quality which is familiar to presidential elections but hasn't really been around this cycle. Maybe people also just needed a happy, lighthearted distraction from the stressful and disheartening debate? For whatever reason, the Ken Bone meme is spreading some happiness and laughs throughout a country which definitely needs it.